UPDATE! (july 2012). I wrote this post 5 years ago. We had recently moved to Switzerland (still here), and I was trying to a)do something with my time (now I have an almost 4 year old to keep me busy), b)bring some familiarity back to my life, it was overwhelming to be in a new country living a new life. I pinned this (and a couple other posts) on pinterest, just trying it out, and I am super surprised to see how many visits it brought. I will read the comments and try to update the recipe to answer questions. Thanks! Add oil (or melted vegetable lard) and water and start mixing . When the dough is firm enough to handle, knead it a bit on a flat surface. Make several round balls (called “testales”), and place them on a floured surface (cookie sheet works great). Cook your tortillas on a “comal”, flat griddle or skillet at medium heat (mine was on 6 on an electric stove). You don’t need to oil the skillet (there’s enough oil in there). It takes about 1 minute to cook on the 1st side (you will see some bubbles appear on the surface, this is normal), then you turn and press with it down with a flat turner to make a bubble again it takes about 30 seconds on the second side. Do not overcook or they will turn hard like cookies. delicious cookies, but not good for burritos. Eat them warm with butter, avocado, queso, or refired beans, but to freeze or refrigerate, make sure you cool them spread out on a flat surface before bagging them. thanks to all those who have taken the time to comment and give tips and feedback! I don't know why I cannot reply on each of your comments individually... but I read them and I appreciate them! Jazy making tortillas?! It's the end of the world as we know it!! I only tried making them once and it was hard, but worth it. I'll have to try your recipe. Tell me... are they like the ones you can buy on stores, in the bread isle? Those one are ok to do wraps... yours are not "smooth" when cold? to cindy: they are definitely not like the store's. you can tell the difference. (they're not "waxy"). they taste better when warm, they're not very flexible when cold. I made them for Burritos, so even though the other half really enjoyed his "mexican pizza" because they were so crunchy, I would have really liked super soft Burritos. These are delish & we made them with things in our pantry. I can totally relate with Em tho - crunchy not stretchy and chewy like I would prefer. Hubby thinks the lack of lard is the problem? > any advice welcomed. I love making tortillas, thanks for the recipe I'm going to try it this weekend. @em, try putting the tortillas in a plastic bag afterthey come out of the pan, pile them on top of each other, the steam should soften them up a little. Increible la casualidad, estaba buscando una receta para hacer tortillas, entro en pinterest y encuentro las tuyas en primera pagina. Muchisimas gracias por compartir la recetas y las fotos del paso a paso. hey i found your recipe on pinterest the other day, and yesterday i tried it, and they turned out absolutely great. ive already tried making torillas at home once, but it was a disaster, so i was a bit afraid to do it, but it was really easy and great. thanks for the recipe! I did not knead mine long enough, and did not put in enough salt. Still delicious, but too fragile. Knead longer than you do for pie crust. I cant wait to try this out! Thank you!!! AWESOME recipe! Mine weren't hard or crunchy like some other comments state. They were soft, flaky and perfect! It was an interesting dough to work and I was afraid they wouldn't turn out. Boy, was I pleasantly surprised! This will be replacing the recipe I've always used. Thank you for sharing. i love all of the pictures that you have on your recipes to show each step- I wish I did that on mine! maybe I should start! haha thanks for the recipe.. I can't wait to try these! Found this post through Pinterest. I've been making homemade tortillas for about 2 years now. When I take them off the griddle I let them sit on the counter for a minute or so to cool enough that I can touch them. Then I transfer them to a large ziploc bag with a moistened folded paper towel in the bag. Close the bag. The heat from the tortilla creates steam and keeps the tortilla soft. When I want to use them again after being in the fridge I just put the entire ziploc in the microwave with the bag slightly open. Because the paper towel has held the moisture it creates the steam thing again, making them soft. I also roll mine on a silpat silicone baking mat. Works great and you don't need to use any extra flour. 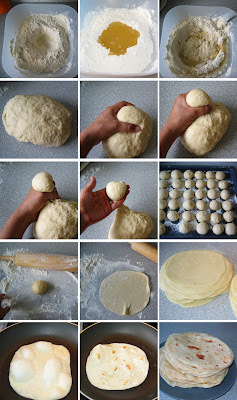 I don't flour my rolling pin because the oil in the tortillas stops them from sticking. I have never used oil I use lard that is the way I was taught I will try the oil to see the diffrence it makes, and the reason they do not taste like the suppermarket ones is that they do not have all the presevetives they need to keep them fresh (fresh is not the word)keep them on the shelves longer. I cant wait to try this recipe, when I was a little kid I remember going over to my Abuelas(Grandmothers) after school and eating fresh tortillas. We would spread butter on them after they came off the griddle and we would fold them in half then again into a quarter so the butter wouldnt drip out while we ate them. In a comment I read about while going the the comment thread I noticed someone say they tryed using or thought about using a tortilla press. Well tortilla presses are for Corn tortillas or Maseca tortillas. Another helpful tip to the person asking about Maseca tortillas, the recipe can be found on the side of a "MASA" bag, this is the brand of the fine corn meal used in making maseca tortillas and tamales, the recipes really only calls for salt and warm water if i remember correctly. Hope this was of some help! Again i cant wait to try this, Thanks for posting. came across this on Pinterest today & made them tonight! I halved the recipe & used 2 cups all purpose flour and 2 cups whole wheat flour... they came out delish!!! thanks so much for the post. After few trials, this is one of my favorites! I only use 2 1/2 ts of salt, 3/4 C canola oil or one stick of unsalted butter if I am in the mood for Puerto Nuevo tortillas style, water adjustment to 2 1/2 C and up to 3 C, depending on weather. IMHO, resting dough [or balls] for one hour [covered] is key. Heat your griddle at medium-high, cook rolled tortilla for about 1 minute on the first side [ few brown spots underneath], flip with a spatula and press 'gently' on any bubble on the surface with the spatula, this will cause steam to blow the tortilla up like a balloon 95% of the time while cooking evenly and creating a much softer product. Transfer to a tortilla warmer lined with paper towels. My SIL cannot digest baking powder, if you want to omit it, use 50-50% hot water and milk, they will be tender crazy and will balloon just like leavened tortillas. Cannot wait to try your MOLE recipe with tortillas, THANK YOU! cool beans!! We spend soo much money buying tortillas because we eat them so often..thanks...I'm going to use whole wheat flour! This recipe right here is for those who CANT buy "Maseca". Im not hating on the recipe, Im going to make anyways but surely its not the same as a real tortilla with Corn Flour. If you use lard instead of oil it wont be oily, less salt and use BOILING HOT WATER instead of warm and they will stay soft for days on end hot or cold. I would love to try this, but was wondering if anyone had tried this with Whole Wheat Flour? I tried whole wheat and they're perfect! you can even add a little flavor like chipotle or tomato, pesto...I don't think you can use them as wraps because they're not flexible, but they're way too good! Anyway you can make burritos and change the fillings, great recipe! Thanks for reminding me how much better these taste when homemade! I used to make them a lot years ago when we lived way up in the mts. I "fried" them in an electric skillet, and they were very fast & easy that way, it went very quickly. Don't cook for very long at all! They're flexible if you don't overcook. Of course I used lard back then, I don't know if that made a difference in the flexibility, but I never had a problem with it. I'll have to try the oil & see how it tastes. Am thinking the idea of a little flavor added is a super idea! My boyfriend makes tortillas almost as good as my Moms. I have never heard of a tortilla getting hard or crispy or not flexible. He said it's because of too much baking powder. So maybe cut back just a little and always cover with a towel as son as they come out. Found on Pinterest. Thanks for the recipe! We will be using lard, also known in Mexican markets as "pig butter". After researching quite a bit online, we found it is no less healthy than other forms of fat. It is the traditional ingredient used in tortillas. I have found the prospect of trying to make my own tortillas daunting... until now! Don't throw away ur old bacon grease, throw it in your torts. Flavor is out of this world. Always cover them up..
then add enough WARM water to get a good mix. DON'T USE HOT WATER! Using hot water makes the mix too sticky, so only use warm water. You will knead it for a while before you separate it into little balls. Such a wonderful tutorial! I can hardly wait to give this a try this evening. Thank you! Hello, on the issue of the Tortillas going hard after being made, we have always had a Kitchen towel folded over and we stack the tortillas in between the towel after we take them off the griddle. This keeps the tortillas pliable/soft. When you are all done cooking/eating your tortillas you should store the tortillas in a ziplock bag in your fridge. Whenever you need one or two, reheat them on a hot griddle, they will be soft once again. Tortillas are just like any other bread product, if you leave them out in the open, they get hard. I made these tonight and they were a hit and so easy! Thank you! Para que las tortillas no se hagan duras en lugar de echarles aceite se le echa "manteca" en ingles es "lard" y los testales si lospueden meterlos al refrijerador y despues usarlos. Hi, I tried your recipe today. They were awesome, it yielded a ton! It was a lot of work but worthed. My husband loved them as well. We made burritos while they were still warm. Please keep posting recipes! PS - Im trying your sushi next week. 1st time. can't wait to try this as flour tortillas are our faves and love that there is no press involved! thanks! You probably didn't roll it out enough. Try rolling it out until they are almost see through thin. Actually Mr. Insaneman this recipe is for those that live in the northern part of Mexico. My mom is used to making tortillas de harina. While my dad, being from the southern part, is use to making tirtillaa de maiz. Which is the correct term for corn flour tortillas. I, being accustomed to both, make both. Depending in what I am cooking. Tortillas de harina go hard for many reasons. Not enough lard. Too much baking powder. But it's usually because they are not being rolled out to where it us almost completely thin. has anyone tried these with gluten free flours? Can you use white flour instead of wheat? I just had to say...its all about the lard..we have made these for the last 50 years...use lard and they will stay softer and more plyable to make burritos,,,mmmmmmmm a few dozen of these and a huge pot of green chile.. you have a yummy meal for the entire family..make the day before and reheat when ready..best way to reheat is oven 400* spread out on middle rack for about one minute. Use while still warm.. just thought I would share..
Just saw your recipe today. Will be keeping it for future use. Thanks for posting it. My grandmother made the best flour tortillas from scratch. The whole neighborhood enjoyed them. In my opinion the are best served with bacon grease refried beans. I always help roll em out but I never learn to make the dough. She measured with the eye lol. These look very similar and I'm going to try to make these. Thank you for sharing your recipe. Too much oil or lard. Also, be careful not to over kneed the dough. Looking for a good recipe for chicken enchiladas with green sauce. For INSANEMAN: My best friend is Mexican and runs a Mexican restaurant. She told me that the difference between a burrito and an enchilada is that burritos are made with FLOUR tortillas and enchiladas are made with CORN tortillas. They are BOTH authentic Mexican tortillas. Just different applications. how long do these tortillas keep in the fridge and freezer? they look really great! Is there a gluten free recipe without potato starch? My wife has celiacs and arthritis and loved eating flour tortillas until a few years ago. That is way too much oil, try this. Sorry Teresa but you do not put baking soda in tortillas, you put baking powder. White flour is wheat flour. It is just processed. If it is whole wheat flour then it's not processed. They started calling white four wheat flour to make it sound healthier. Can you use alternate to wheat flour? Can you use rice oil I don't eat canola. Hi there! I just want to share another thing to make with Tortillas. I used to make fresh torts every morning 5 am . I made fresh Burritos for my husband for lunch. And had to have them for dinner, plus snacks for my boys lol. Well I also would refry beans ahead of time, after I roll out the Tortilla I would fill the tort with beans making a TurnOver ans sealing the ends. ( EMPANADAS) Deep Fry them a few minutes each side. My family loved them. Now my daughter in law makes Torts and my son makes the beans! Love Traditions! Consuelo Montano. Just some suggestions...I make these all the time. Best to add hot water just hot enough that you can use your hand in the mix it helps it spread better when rolling it, if it shrinks too much is cause the water was not warm enough. You really don't need that much oil. Oil makes it taste like crackers Lard is way better its makes softer and taster tortillas. I wrap the left over tortillas with paper towels and zip lock it, it keeps it soft. I didn't see salt in your ingredients, did you not add it? How much lard would you add? 1 and ¼ cups warm (best as hot as your hand can take don't burn your hand.. Lol) knead very well. If doe (masa) feels sticky just sprinkle more flour. I use lard and sweet full cream instead of the water...Puebla style. Use whole wheat flour made for pastry, not whole wheat bread flour. I've been making tortillas since I was eight . My mom used lard but I use crisco. I add the crisco and water and microwave it for about 4 minutes to get it hot. Pour it in middle of ring and wait a few minutes , then knead. I've made jalapeño , red chili powder tortillas . Trick just remove seeds and grind jalapeños n flour or sprinkle red chili in flour mixture. Oh and I also add a bit more baking powder to keep them flexible. I have had good success pressing these with a glass pie plate. Curious about the tikka masala recipe that you went with?? Can this be kneaded in a stand mixer? Or does it have to be by hand? My Abuela used flour, salt, lard, and hot water. Put directly on burner for a few seconds the flip and done. The uncooked tortillas can be cut and fried in oil to make sopapillas. Sigo sin poder hacerlas ya me han a enseñado a hacerlas ya las trate con la receta y salen como tostadas aunque alguien mas me haga la masa. A d ser algo con mi forma d extenderlas o algo esta algo mal conmigo ajjajaj :-( nimodo lo seguire tratando algun dia me tienen q salir. April Espinoza if you use olive oil, it becomes similar to the Italian piada, used for making piadini... It is delicious! With olive oil, they are not good for mexican or tex-mex cuuisine. With oil, they are delicions with Italian cuisine. Try this. 3 cups of flour, 1 tsp salt, 2 tsp baking powder, 3 tbs lard and 1 cup warm water. Mix until the sides of bowl are clean and dough is not sticky but soft. Then cover and let it sit for 15-20 min. They should be good then. Yes u can use a stand mixer. I use it to mix mine. Kitchen aid. Put in a 1 gallon freezer bag keep the steam in and just keep adding they will be very soft for rolling. I've been using a tortilla press for years and my tortillas come out perfectly round. I am so happy to see your recipes. I lost my grandma 4 years ago and she used to prepare fresh flour tortillas. And I never got her recipe. I am so happy to see this one. I have printed it and will be trying it very soon. I will also try your churro recipe. My grandma also used to make a little round donut she called a "boyito". I sure the spelling is wrong, but that is how its sounds. A drink called "ponche" and a dessert dish called "copidatatha". I'm sure the spelling is wrong for all of these, but if you happen to have a receipe for any of these dishes, I'd be forever indebted to you. Thanks again for the recipes. Hope your enjoying Sweden. Instead of cooking all of them can I keep them in the balls and freezing them instead of flatting them and cooking? Then when I want some tortillas i can pull them out and cook them. Another great way to enjoy is with butter sugar and cinnamon! Decrease salt, baking powder and oil by 1/2 and you will be amazed at how soft your tortillas will come out. I make tortillas all the time. Even with flaxseed, quinoa, barley and buckwheat. All very soft and delicious. It's not easy to do properly .....!! I use lard to make mine. I am able to roll them thin enough to read through. DELICIOUS! They make awesomely light and crunchy tostados shells. So I made this one and as I was done needing it the dough was falling apart what did I do wrong ??? I made these and they turned out really well. I already knew how to make Indian Fry Bread and these are not much different except that you don't fry them. The secret is not to cook them too long, as soon as they start bubbling, turn them. They are quite delicious served while still warm. My family loves them. If your tortillas are coming out too hard, try using crisco (vegetable lard) instead of oil, i don´t make them with oil. I'm living in Ukraine. Mexican food is one of my biggest missed items. It is spicy and delicious- two things they don't have much of here. They also do not have tortillas. I have tried all kinds of flat breads to make tacos and burritos... all failures. When friends or missionaries come to visit us and ask if we need anything, I always say, "tortillas!" I have my "testales" sitting in flour, waiting it out for an hour... or a half hour if I can't wait! I use inexpensive coffee filters between my tortillas and crepes. Keeps them from sticking together. I'm going to try this, but I ONLY use coconut oil, (melted on top of stove, NEVER in Microwave!) we'll see how it turns out. To break it down further, 1 kilogram is about two pounds. But that STILL won't help you if you are in Canada or the U.S. since we measure our dry ingredients by measuring cups, NOT by weight. Coconut oil works great, but definitely cut down on the amount of oil you use. Here's my recipe from Guam: 4 cups flour, 1 tbsp baking powder, 1 tsp salt, 1/3 cup lard or coconut oil, 1 1/2 cups (1 can) coconut milk. Knead, rest, roll out and cook on flattop (cast iron skillet is my preference) just as you describe. I've used my bread maker on "dough" setting to mix and knead. :) I'm lazy! 1 kilogram = 1000 grams. ... 1 Australian Metric Cup = 250 grams - hope this helps. Have you tried this with whole wheat flour yet? I cut down on the oil and the baking powder. My tortillas are softer since I've been doing this. I used to live in a warm climate and my tortillas always came out wonderfully. Then I moved to a colder and rainier climate and they never came out right. Eventually, I figured out they tasted better in the summer than the winter...until the one winter day I accidentally left the dough on the counter above the running dishwasher to rise. They were PERFECT. That's when I realized I HAD to let it rise in warmer place. After a bit of experimentation, I found that (in a COLDER climate lacking sunshine) letting it rise in the microwave (NOT TURNED ON) above the stove with the stove lamp light on...worked perfectly for 30 minutes. A well insulated heating pad on a very low setting also worked. Now, I think I'll go make tortillas for breakfast. Great idea. First, I have a question. Could you please tell me what you are doing so you can live in Switzerland? I'd love to do that. I spent two summers there, and returning is one of my life goals. Thank you for this recipe. You said they do not taste as good as your mother's. I'm guessing she probably used melted lard. You may want to give that a try, if you are game. :) Thank you. I like That. Everyday Morning It make our HomeUnit. Three ingredient tortillas...add equal parts bisquick and all purpose flour. Then enough warm water to mix up a good but not sticky dough. Roll into about 6 inch tortillas that are fairly thin but not too thin to pick up and cook on hot griddle each side. Enjoy! This is a chapati. They are very common in Uganda where you can purchase them from street vendors. If you want eggs and veggies in them "taco or burrito style" it is called a Rolex. Oh and if you add finely shredded carrot and onion they taste even better. So how much lard to your 8 cups of flour? I'm native american.. particularly from the Navajo tribe and this exactly how we make our torillas. .but with out the veggie oil.. fry Bread is made the same also but of course fried up in oil or lard...it's great with almost everything !.. Hello, just wondering if the 8 cups of flour includes the 1 cup for rolling the dough. To whomever wrote the introduction to the recipe, corn tortillas are made with corn that is cooked and turned into MASA (corn dough). MASECA is a brand for a company that creates some kind of UNHEALTHY mixture to make tortillas with, but who knows what they put into it. It must have some pretty strong and unhealthy preservatives and chemicals because tortillas made with that crap can last forever in a museum. So don't be ignorant and use your forum to share misguided information. If you have never tried corn tortillas with real corn masa then please don't write about it since you don't know what real tortillas are!!!! The recipe I follow was my motherinlaw's. Her recipe calls for manteca (lard). That's the Mexican traditional way. I remember my abuelas using manteca too. You are spot on! Didn't see your comment until after I posted mine. My grandkids love to roll out the tortillas. Does bacon fat work better?? I use the Light Virgin Olive oil from Costco they're perfect and soft. I tried regular olive oil but they came out tasting too much like olive oil and they hardened. Can I use bread flour in substitution for the All Purpose flour? As far as I am concerned, homemade, handmade flour tortillas were my mother’s signature meal. She made many things well, but will always be remembered for her flour tortillas. The best way to eat them? As they come off the comal. My favorite way to eat them is with some butter or with an avocado and salt. Traditionally, lard is used but if you don't have any, try oil, I guess. When I used to make tortillas, I'd stack then in a large plastic bowl and put the lid on after adding each one. Plus, I'd occasionally flip them over. This kept then nice and soft. I'll have to try your recipe. I used to buy Harina Preparada and just add hot water. Actually 1/2 bacon fat and 1/2 real butter(Amish or other high fat content 86%) makes killer tortillas! They will look kinda weird because of the spots created by the drippings but once you have them all others will pale by comparison. Did you know you can freeze the balls and thaw and cook them as you need them? It makes the process much less daunting, and they are wonderful fresh cooked. It's how my hus band and I keep from over indulging! We've been making tortillas in our family for ages, and it's taken me several failed attempts to get all the measurements in order. The reason why your tortillas aren't flexible when they cool is because of all the baking powder. I don't even measure my baking powder. I just sprinkle about a pinch into four cups of all purpose flour. I also scoop in half a cup of vegetable shortening. Tortilla dough doesn't rise until it's cooked, but it would be wise to let it sit five or ten minutes before using it. How do i measure 1 killogram of flour? I have the same question. Non wheat flours are SO expensive I get tired of wasting them when stuff isn't tasty. I dont understand why you need to use oil and baking powder. I have been making whole wheat flour tortillas ( you call it) Roties or chappaties as we call it with just salt and warm and most of the times cold water for the last thirty five years and they are soft and healthy. You wrap them up in foil and store in the fridge and warm it up on the skillet or microwave oven and they stay for ten fifteen days. Dont use baking powder or soda unnecessarily. Crisco (vegetable shortening ), salt,flour and water. Nothing else needed and don't melt the shortening. My mother and her mother, grandmother, great grandmother used the recipe for the best flour tortillas I've ever had in my 46 years. They're from Matamoros, Tamaulipas, Mexico and have used only those ingredients for a very long time. I love making fresh Flour Tortillas, however, For me, I love to use Butter instead of Lard or Oil. I know it's not the traditional way, however, I love the Butter flavor it imparts on the tortillas. Lovely posts! I was ten when my mother taught me flour tortillas. For the lady who posted as "msa" -- your grandma's dessert dish that you spelled as "capidatatha" is actually CAPIROTADA which is a type of bread pudding -- very rich and good. Try searching on that word. Enjoyed all the comments. Thank you. This blog was created to share some of my favorite and/or new recipes. The food is not necessarily all mexican, but since I do miss mexican food a lot I will be trying to recreate some of my fav dishes. Most recipes are adaptations of something found online, or just my "throw-stuff-together" kinda cooking. Measuring stuff is not my strong point, so feel free to guesstimate.